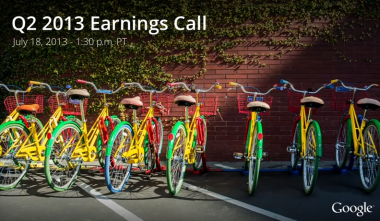 After a rare earnings miss on Thursday, Google executives took to their quarterly call to explain their business. 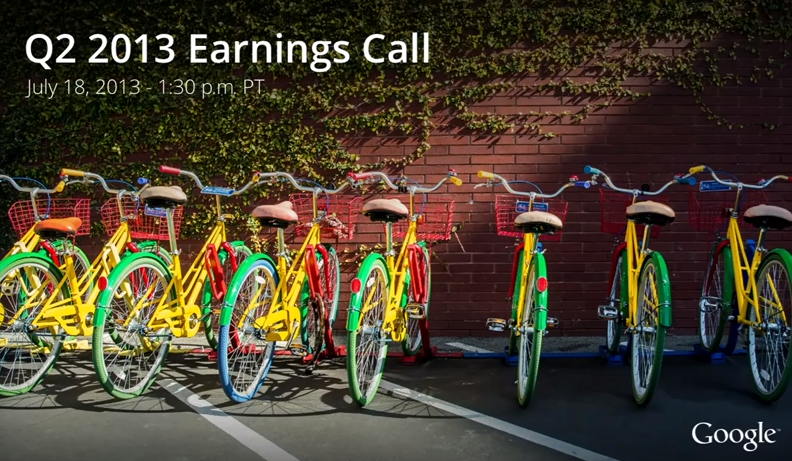 Google had earnings of $9.56 per share on net revenue of $11.1 billion in the second quarter, below analyst expectations of $10.80 per share on net revenue of $11.4 billion. On the call, CEO Larry Page and his team said their main focus for both end users and advertisers is to unite their experience across all the screens in and around them. 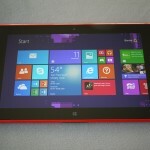 “We live in a world of abundant computing, with multiple operating systems and increasing numbers of devices,” Page said. As for new milestones on that front, Google transitioned 75 percent of AdWords campaigns onto its new “Enhanced Campaigns” product over the past six months, which helps unite and target ads across devices. But the Google execs shied away from offering details of how various businesses like mobile ads and Google Fiber are going, or predicting when new businesses like self-driving cars would get off the ground. 1:35 pm: Larry Page kicks off with prepared remarks, talking about the “velocity and execution of our platforms, apps and devices” in a world of abundant computing. He notes more than 1 million people tuned in for the Google I/O keynote, and 1.5 million Android devices are being activated every day. Some 50 billion apps have been downloaded from Google Play, and more money has been paid out to developers this year than all of last year. Plus, Chrome has 750 million users around the world. 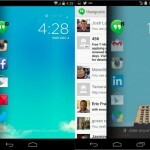 And Google launched Hangouts, which includes video calls from the phone. On the advertising side, 6 million ad campaigns — almost 75 percent — transitioned to Google’s new Enhanced Campaigns, marking the biggest ever change to AdWords. On devices, Google launched its own cleaned-up versions of the top Samsung and HTC phones, and new stuff is coming from Motorola that Page says he’s excited about. Plus, he’s stoked about the new Project Loon to bring Internet access via high-flying balloon, which he says he and Sergey Brin have been thinking about forever. Now, finance honcho Patrick Pichette with a bunch of quarterly numbers that are probably better read than spoken. 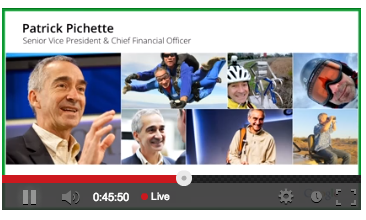 While he’s talking, the Google livestream is showing a collage of images of Pichette skydiving and biking. None of them show him sitting in front of a speakerphone. 1:51 pm: Nikesh Arora, the company’s chief business officer, says it has been a strong quarter especially in autos and Brazil. Arora wants to talk about three key areas of investment for Google: Creating a marketing platform across the expanding connected world and all sorts of devices, Google’s marketing funnel, and non-ads businesses like hardware, enterprise and Google Play. 1:58 pm: Still no real talk about why earnings disappointed, but now it’s time for analyst questions. Pichette explains the ad campaigns transition was a lot of work, educating advertisers about mobile, etc. He says the ROI should improve over the long term. In response to a question about what hardware areas are potentially interesting, Larry Page says, “It’s always a mistake to assume technology will be static.” He mentions Google Glass and “new ways of interacting with hardware and new types of hardware.” He says using Glass feels like “living in that future.” But he doesn’t go into any detail whatsoever. Pichette says Q2 expenses were normal and disciplined. And a question about changes in the hiring environment over the past year or two. Page says he hasn’t seen much of any recent change in recruiting and small acquisitions, and retention has been good. Where can Google invest? “It’s pretty easy to come up with ideas, it’s pretty hard to make them real and get them to billions of people,” says Page. What makes him excited is doing technological innovation at scale. The quarter saw a “network sites” (meaning partners who run Google ads) deceleration — was that self-inflicted? Pichette says yes, Google’s stricter DLAs and policies are having an impact as compliance is enforced, but it’s better for everyone. 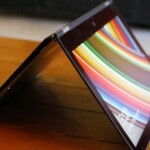 What about mobile ad conversion? Arora says you have to look at transitioning between devices, and understand that with mobility you understand a lot more about a user. What’s the timeline for Gmail updates rolling out? Page says he’s not sure, but Gmail is healthy and growing and he likes the new features. 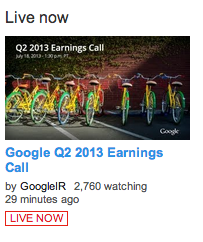 By the way, this broadcast is a lot less popular than Google I/O. No million viewers here! Which kind of makes sense, because they’re not saying much. Pichette says to expect the changed policies for ads to take a year to flow through the system. But he reminds everyone that the fundamental issue is providing a great user experience, which may cause some “hits in the short term” for the good of the long term. Migrating six million campaigns took six months, so the impact is graduated. Long term, the impact should be simpler, faster, better ads. But Arora doesn’t want to detail the effects now. Except that they will help conversion in the long term. But no details. Will users ever be able to purchase items without leaving the search results page? Page doesn’t say yes exactly, but he says streamlining in general is good. 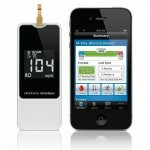 The San Francisco Bay Area same-day delivery trial is an example. As for Google’s product listing ads, as overall searches move from links to entities, ads are aligned, says Arora. But it’s too early to talk about the impact on click-throughs. That’s a wrap. Here’s the link to Page’s full speech from the beginning of the call via his Google+ page, which uses derivations of the word “excited” four times. Not that I’m fixated or anything.